If you're looking for comfort food, then you've come to the right place. This is one of those recipes that always hits the spot and it makes the whole house smell like home cookin'. You can do it in one large casserole, or individual miniature pies. Simple! 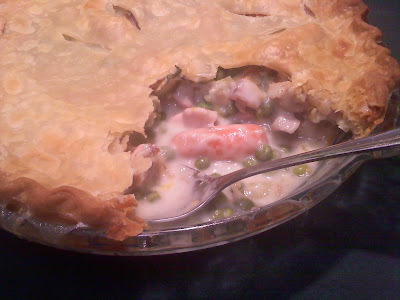 Oh, and btw, some people might suggest that it isn't a pie unless it has a bottom crust. Well then, by all means, bake the filling in a two crust pie! Saute onion, celery, & carrot in butter for 10 minutes. Add thyme leaves and give it a good stir. Add flour to sauteed mixture, stirring well. Cook 1 minute, stirring constantly. Combine broth and half-and-half; gradually stir into vegetable mixture. Cook over medium heat, stirring constantly, until thickened & bubbly. Stir in salt & pepper. Add chopped chicken, stirring well. Pour chicken mixture into a greased shallow 2-quart casserole. Top with pie crust. Flute to make a decorative edge. Cut slits to allow steam to escape. Bake for about 40 minutes or until crust is golden brown. Instead of peeling and dicing carrots, sometimes I just use a bag of baby carrots (as you can see in the photo). No peeling, no chopping, done. Oh, and I also used a ready-made pie crust. SO much easier! If you don't want to add a rotisserie chicken, you can easily cut up some boneless skinless thighs or breasts and then just let them cook in the sauce. Instead of using regular pie crust to top your pie, try topping it with biscuits. (you know, like the ones that pop out of the can.) Paula Deen serves hers with a puff pastry lattice on top. Then she breaks off pieces of it to dip into the filling. That woman seriously knows what she's doing!